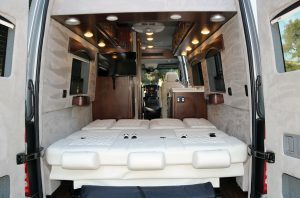 Created using the Mercedes-Benz Sprinter 3500 chassis, these Type B motorhomes exhibit the same handcrafted quality that goes into the restorations of classic cars that first earned the parent company its reputation. 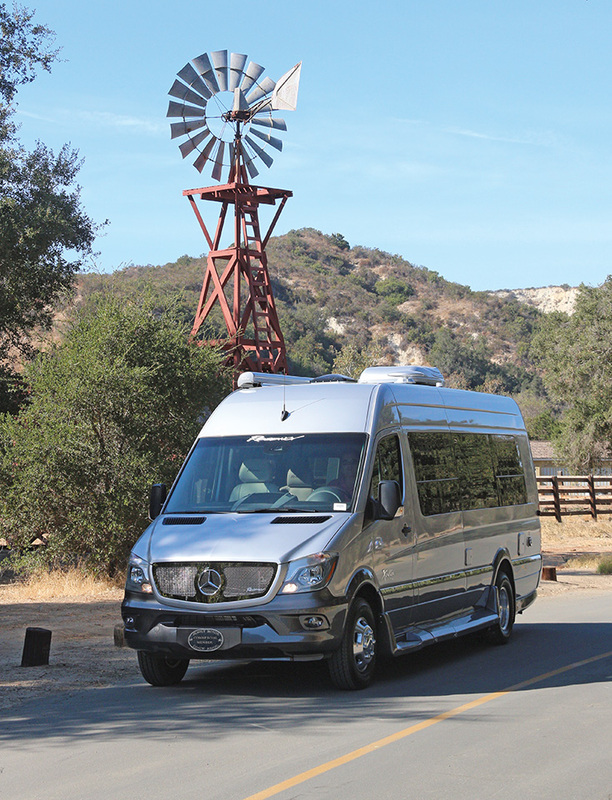 Although a relatively new player in the Type B motorhome marketplace, Regency RV has roots in a company that boasts a long legacy of fine craftsmanship — the Wayne Davis Automotive Group. Wayne Davis started the company in 1974 to restore and customize classic American cars and earned a stellar reputation in this arena. The company went on to operate Regency Conversions, reportedly at one time the largest van conversion company in the United States, probably in the world, converting 800 upscale vans a month (yes, a month). The company also has been a respected and sought-after up-fitter of luxury 4×4 trucks. Wayne Davis’ lifelong automotive passion immediately becomes apparent when one enters the front door of the company’s facility in Fort Worth, Texas, and is greeted by an automotive museum showcasing his collection of vintage cars and hot rods. Being in the auto restoration, custom van conversion, and 4×4 truck up-fitting business for so many years provided the company the broad scope of skills and technical capabilities for entering the highly competitive Type B motorhome segment of the RV industry in 2016. In July 2017, the Wayne Davis Automotive Group exited the 4×4 truck market and committed more in-house talents and resources to creating Type B motorhomes. Wayne Davis Auto Group also remains one of the top vintage auto restoration companies in North America today. A leather-wrapped steering wheel is an option on all Regency motorhomes. 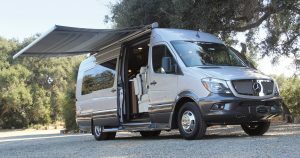 The company is now into its second year of producing Type B Regency motorhomes, and the Mercedes-Benz Sprinter 3500 chassis with a 170-inch wheelbase is the only platform used. 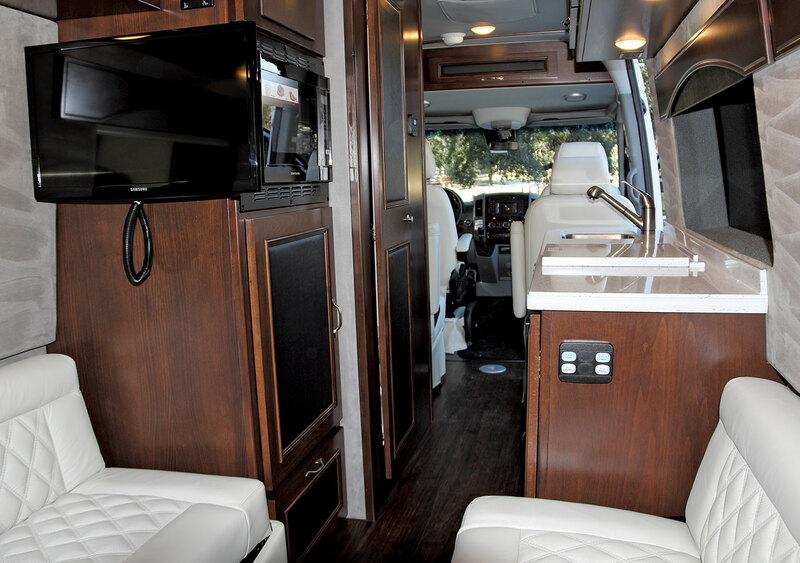 With this wheelbase, all Regency Type B motorhomes have an overall length of 24.5 feet. The Sprinter 3500 comes with tandem rear wheels that yield stability, comfort, and performance over the road. The Mercedes-Benz 3.0-liter V-6 turbocharged diesel engine comes married to a five-speed automatic transmission with “bump” shifting. This shifting feature allows the driver to touch the gearshift and move it to the right or left to access the desired gear. This is especially useful when motoring down a grade or an off-ramp. The Mercedes-Benz diesel engine yields 325 pound-feet of torque and develops 188 horsepower. Mercedes equips the unit with a Class III hitch receiver. The Regency is rated to tow 5,000 pounds, so this allows the owner to take along toys, a trailer, or a small towed vehicle. The Mercedes Sprinter chassis also offers four-wheel drive as an option; time must be allowed for ordering this unit from the Sprinter plant and having it delivered to Regency before the up-fitting process begins. The four-wheel-drive system is solenoid actuated. Pushing a dash-mounted button engages it (speeds during engagement or disengagement should not exceed 10 mph). Because the four-wheel-drive option is designed and installed by Mercedes, the three-year/36,000-mile Mercedes warranty comes with it. When Regency RV’s production capacity is reached, one unit a day, or approximately 220 units a year, will be completed. Company officials expected this to take place in mid-spring 2018. The Regency Xalta LX comes with a powered 13-foot patio awning. I recently had the opportunity to review the Regency Xalta LX 4RS. This is a traditional Type B, with the Sprinter van supplying the walls, floor, and roof. It came with a suggested retail price of approximately $161,000, which included a number of options. The Regency Xalta currently is available in four floor plans. The 2TB comes with two captain’s chairs and twin beds. The 4TB has four captain’s chairs and twin beds. The 2RS LX has two captain’s chairs and a rear sofa. The 4RS LX, the floor plan I reviewed, has four captain’s chairs and a rear sofa. At this writing, two more floor plans were in the works. Wayne Davis Automotive Group is a vertically integrated company, which means they use in-house engineering, design, fabrication, and assembly resources to create and build the Regency. The cabinet doors, stiles, rails, and drawers are fashioned and finished from American beech wood. Even the magazine rack and cup holders that lace the interior of the Regency are fabricated in-house using American beech. The solid-surface Corian countertops in the Regency Xalta LX are designed as well as cut, edged, and polished in-house. The solid-surface Corian countertops are designed and also cut, edged, and polished in-house. All of the seats, including the heated cockpit chairs, are dressed in leather by the Regency RV upholstery shop. The windows and window treatments are fashioned by employees. A paint shop is housed within the company’s 50,000-square-foot complex in Fort Worth. My review coach had a Mercedes-Benz factory silver exterior. To this Regency added their Sport Paint option to all the bottom quarter panels. This is one of three paint choices. Buyers also may choose full paint as an option or the standard monochromatic look. Regency employees paint any exterior vents and cowlings on the roof of the vehicle to match the chassis color. Custom-designed running boards are added as standard equipment; they are both smart-looking and functional for those entering and exiting the coach. Low-energy LED lights line the exterior grab handle, making it easy to see and enter the vehicle through the sliding side door when it’s dark outside. For air circulation, the sliding patio entry door can be left open, and an optional custom-designed pull-across screen provides a tight barrier against insects. Adjustable high-velocity powered ceiling vents facilitate air circulation inside the vehicle. American beech wood is used throughout the Regency Xalta LX. The interior walls and headliner are dressed with padded Ultrasuede material. The windows, with custom coverings, are accented by handcrafted valances. Wood-look vinyl flooring stretches from front to rear. The interior lighting package includes overall lighting as well as reading and directional lights. 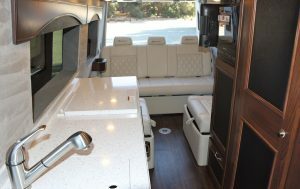 The Mercedes-Benz cockpit can be augmented with a luxury-stitched leather-wrapped steering wheel as an option on all Regency motorhomes. For enhanced listening enjoyment, Regency RV adds two speakers overhead in the cab area, and two overhead in the rear of the unit. The Regency Xalta LX Type B comes factory equipped by Mercedes-Benz with a lane-departure and blind-spot warning system. Removable shades for both the windshield and door windows come standard. They connect magnetically to the van-body pillars. A marine-grade battery disconnect is located on the side floor panel inside the sliding side door. 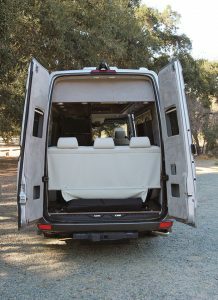 A coach-wide bed is created in the rear of the Xalta LX 4RS by folding down the seats in the rear of the vehicle. In the Xalta LX 4RS reviewed, two rear jump seats on each side of the motorhome fold flat and combine with the power bench seat at the rear of the vehicle to create a coach-wide bed. With its motor-operated feature, the rear bench seat folds flat in seconds and returns to an upright position just as quickly. The 4RS is designed to sleep two adults. This vehicle also is great for running around town or hauling several players to a soccer game. With its 6-foot-3-inch interior height, moving about inside is easy. All four of the captain’s seats in the Xalta LX 4RS — two in the cockpit and two immediately aft of the cockpit — are outfitted with seatbelts. The seats are adjustable and can be rotated to face one another when in camp. The rear electric sofa has three seatbelts. A removable Corian-top table can be placed near the front or the rear seating areas of the vehicle. The receivers for the posts that support the table are flush with the floor, thereby eliminating a potential tripping hazard when the table is not in service. Fabricated from molded fiberglass, the wet bath hosts a lavatory sink, a handheld showerhead, a marine toilet, and a power vent. Located on the street side of the vehicle, the wet bath doesn’t intrude on the center-aisle passageway that extends from front to rear inside the motorhome. Storage space is accessible via the rear doors of the Regency Xalta LX. The Regency Xalta is an all-electric motorhome, with 30-amp shore power or the auxiliary generator being used to power the water heater, heating system, refrigerator/freezer, single-burner cooktop, microwave oven, and 15,000-Btu roof air conditioner with heat strips. The auxiliary generator is a 3-kilowatt diesel-fueled unit that draws fuel off the main 24.5-gallon diesel fuel tank. A heat pump provides warmth for the vehicle. My review unit included the optional Warm Waves infrared heating system. Heat radiates up from the floor. A wall-mounted thermostat is set at the desired temperature, and the Warm Waves heating system senses which areas are coldest and heats those areas first. A second wall thermostat controls the roof air conditioner with heat pump. A 25-foot 30-amp shore power cable comes standard. A chrome cover hides the point where the cord connects to the coach. A 2,000-watt pure sine wave inverter powers the TV and the optional Warm Waves heating system. The coach must be connected to shore power or the generator to operate the roof air. A single-burner electric cooktop is recessed into the Corian solid-surface countertop. The Corian panel that covers the burner when it is not in service can be inserted vertically behind it to act as a backsplash. The quick-recovery electric water heater holds 6 gallons and is designed to deliver 13.7 gallons of hot water per hour. A 3.2-cubic-foot refrigerator/freezer and a convection-microwave oven add to galley accoutrements. The review unit had the optional 24-inch smart TV, which is mounted on a robotic-style arm. It stows snugly against the wall during transit and permits the flat screen to articulate so it can be viewed throughout the coach when in camp. A 19-inch TV comes standard. Interior storage includes well-thought-out space in the galley, with soft-close drawers. Storage space behind the rear sofa is accessible via the rear doors. A screen is available as an option for these doors as well. The Xalta has no exterior storage. The single exterior compartment houses the holding tank dump valves and the cable hookup and is positioned on the street side. The coach has two exterior inlets for adding fresh water. One is for filling the 24-gallon fresh-water system. The second is for adding water to the radiator on the auxiliary diesel generator. Regency officials rate the Xalta as a three-season motorhome, because the holding tanks are not enclosed. However, electric heating pads on the holding tanks automatically turn on when the ambient temperature reaches 40 degrees Fahrenheit. R-32 insulation in the form of reflective foil and residential fiberglass insulation is added throughout the coach. A 13-foot power patio awning and an exterior 110-volt-AC outlet allow for relaxing outdoors. Regency RV introduced a B-plus model at the Florida RV SuperShow in Tampa in January 2018. This unit also is built on the Sprinter chassis platform; however, the Sprinter chassis used is minus everything aft of the cab. Everything beyond the cab — the walls, the floor, and the roof — is designed and engineered by Regency RV. The B-plus models will have a base suggested retail price of $161,048. Currently, Regency RV has 12 dealers in 20 locations across the United States. This includes Arizona, California, Colorado, Oregon, New Mexico, North Carolina, Florida, Texas, and Tennessee. Company officials forecast that they will soon have a network of 20 dealers in North America. 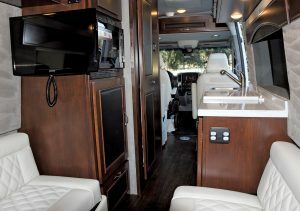 The Regency Xalta LX will interest RVing couples looking for a compact but well-crafted motorhome. It also may be just the ticket for families seeking an about-town or touring vehicle suitable for activities such as tailgating or transporting children to their sporting events.